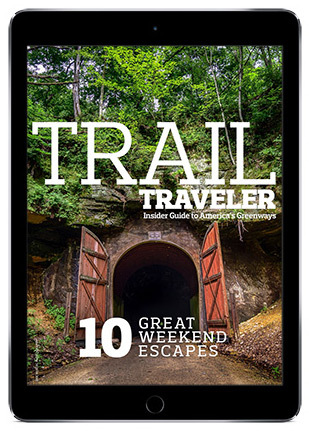 RTC recently launched Trail Traveler, a new digital magazine for tablet computers that is chock full of details for planning trips on 10 premier rail-trails across the country. In this inaugural issue, RTC shares our favorite spots for an outdoor weekend getaway, including not just the trails themselves, but also recommendations for all the things a traveler needs at every part of their journey: lodging, restaurants, bike rentals and fun attractions along the way. Links throughout each article help you nail down all the details within moments, and the magazine’s maps help you find the locations once you arrive. Trail Traveler ($3.99) is available via the App Store and Google Play.